Gog and Magog are the names given to the two offshore stacks that may be viewed from both the viewing platform and (tide and sea permitting) from beach level. They are only 2 minutes drive from the Twelve Apostles but technically they are not considered as part of them. The steps were carved into the cliff by local settler Hugh Gibson who worked on traditional access used by the original Kirrae Whurrong inhabitants. Please note that the car park near Gibsons Steps has limited capacity during the day, so be prepared that you'll probably need to park further the road. This image belongs to the travel and nature stock photo library. This stock photo of Gog and Magog in Black and White is available for licensing for commercial and editorial uses including websites, blogs, books, magazines, brochures and advertising. Restrictions may apply for images which contain third party copyrighted material or sensitive subjects. Photos of artwork are for editorial use only. 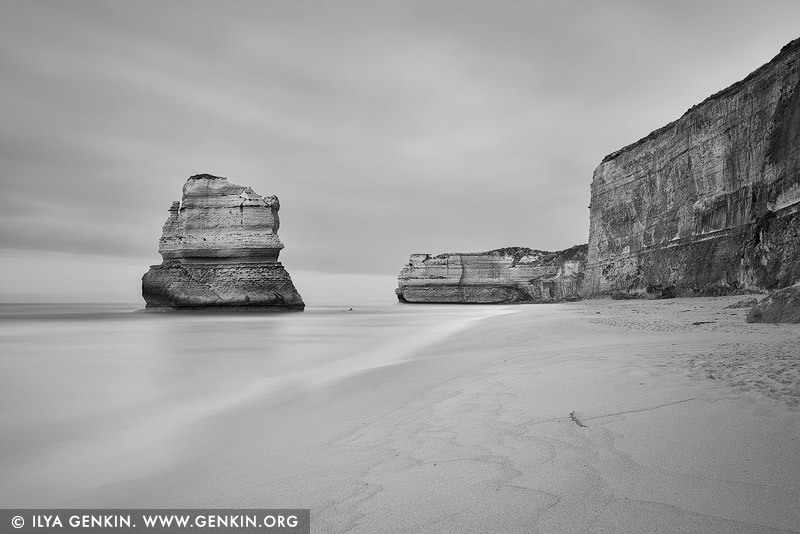 This image id GREAT-OCEAN-ROAD-BW-0005 of Gog and Magog in Black and White, is copyrighted © by Ilya Genkin. This is not a public domain image.